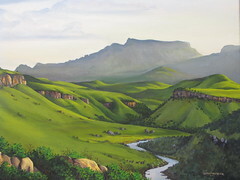 We had the immense pleasure of spending a week with my two kids in the Drakensberg Region, or affectionately called “The Berg” in South Africa, this past week. I had a timeshare week, postponed time and time again due to other commitments, which was soon going to expire if not used, and what better way than to spend winter in S A in a region where you can wake up to snow on the majestic mountains surrounding you. 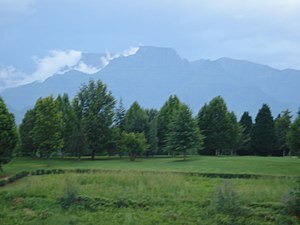 We took the time and made the effort to visit the well-known, world-class resorts, like Cathedral Peak, Champagne Castle and Giant’s Castle during the day, and resting our tired bodies on family sized, crisp clean beds in our home for the week, a lovely cottage set amongst lush gardens at the Drakensberg Sun Hotel. The resort offers beautiful views over the valley as well as the mountains, with entertainment like boat rides on a still lake, squash courts, pools (too cold to swim this time of year, unless you are a polar bear ! ), hikes into fern forests where you expect Peter Pan to jump out any moment, and much more. Our cottage had an indoor as well as outdoor fireplace, a well-equipped kitchen, and all the creature comforts needed to make sure we would want to return. The Hotel staff laid on a spread of salads and breads, including real “pap”, a South African delicacy of maize meal cooked until crumbly and served with a tomato and onion relish – this was particularly yummy! We played Rummicub, charades, trivial pursuit etc on the wide hotel stoep while breathing the champagne air and drinking beer. At night we cooked, or rather my “Masterchef” in the making daughter cooked, and Pa and son made a huge fire for ambiance and warmth. We took drives out to the Kwazulu-Natal Midlands Meander, where I ate the most delicious smoked trout on an English Muffin. Trout farms are all over the place, so it had to be my choice. My husband took us to the remains of what once was a thriving farm circa Nelson Mandela’s release, to show us his masterpiece of a huge steel swing bridge he designed and had built over the Tugela River, so that they could get to the fertile farmlands on the opposite bank without taking the huge detour around the river. It was a poignant, sad affair, as the young farmer whom he worked for at that time was shot and killed just outside the one barn – the time around Mandela’s release was a scary, torrid period in South Africa’s history. Kobus had to find other work, the widow left the land and today the once beautiful house, the quarters where the women who worked the field lived and the building that housed the little farm shop are all ruins. A few bedraggled looking cows were wandering about, probably belonging to some of the local herdsmen who took over much of the land. Each and every resort we saw has its own unique style and allure, and having travelled abroad a few times I am proud to say South Africa is not one iota behind world-class standards for service, beauty and accommodation. Dotted all along the roads are interesting places like “The Ugly Duckling”, a chain store selling the most exquisite furniture and artifacts, “The Waffle Hut” where you can eat a waffle with crispy bacon, banana and maple syrup, and where the most quint little factory allows you to peer through large windows at workers knitting woollen rugs and carpets. An activity centre beckons with quad bike rides through the local village where the youngsters run alongside you, hands outstretched, not for money, but just to touch you! You can also go on a giant foefie-slide (aerial rope-slide) across a valley, or be Tarzan and Jane and swing from tree-top to tree-top in the lush valleys. A nearby raptor centre had us in rapture (excuse the pun), with a most amazing show of their birds and dogs – Pointers taught to hunt with the eagles. I was able to ask some questions on caring for my beautiful owl, and confirmed that he / she is indeed a Giant Eagle Owl, due to having pink eyelids and a huge wingspan. 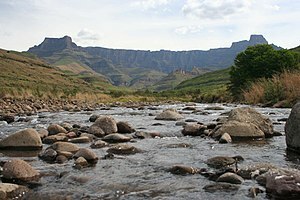 And lets not forget the famous Drakensberg Boys Choir School, where the boys receive an education and are world-renowned for their beautiful renditions of songs, both popular and classic. The best part of this week is that I was just mom again to my two adult children – a blessing and we gathered food for the soul for a while again. For overseas visitors, a must-do, even if you have snow-capped mountains almost all year round. There is so much more to discover, like Hartford House near Notting Hill in the Midlands Meander, where horses are bred to win races the world over, accomodation is a splendid farm-house, decorated in grand style, and food is an affair to remember. You can make your own candles, get the most delicious chocolates ever tasted in my entire life, find any type of bric-a-brac for your home, or just drink in the air and atmosphere. Thank goodness for timeshare, as I probably would never have been able to afford this week. We loved it. This entry was posted in Africa, Love and Life, Nature, South Africa and tagged Africa, Cathedral Peak, Champagne Castle, Drakensberg, Giant's Castle, KwaZulu-Natal, Nelson Mandela, South Africa. Bookmark the permalink. Suletta. You truly paint a beautiful picture with your words and photos. South Africa is on my list but I’m sure I’ll have to sail there as it will take some time to see even a small part of the beauty you speak of. Dannie, so the answer is to sail across – but you must have guts as you will be coming against the roaring forties – and then keep your boat as a base in Cape Town. South Africans are so kind-hearted and hospitable, we will assist you to get where you need to be, spend time and explore!